Middle grade books can run a broad gamut from stories of dead dogs to bridesmaids to adventures on scouting trips. There can be romances, or not, ghosts or not, fear of the dark, braces, or spiders - or not. Middle grade is a great, transitional time. In recent years, there have been a few books about voting for class presidents and such, as tween transition into older, more political thinkers, but I haven't seen as much writing about politics outside of the classroom. In these very odd times, however, I can imagine that's coming. Ask the kid who refused the photo-op with Paul Ryan. "We're not brainwashed," said Jordan McCray-Robinson. "We live in the real world." And indeed, she and her fellow classmates may not know all the issues, but they're old enough to have the outline. Old enough, when paying attention, to have an opinion. Eleven year old Delphine, at the beginning of this series, is fairly indifferent to the news - it's something Big Ma watches, it's part of the stream-of-consciousness "fussing" with which Big Ma fills the air - with her opinions, prayers, and criticism of the world at large. The personal in this book is immediate -- there are details real and specific only to black people, black girls, black families, in the 1960's or otherwise. Williams-Garcia does not include a glossary, nor does she explain them all. These things are personal to her, as a writer, as a woman who grew up in a black family, and personal to some black people. However, unlike the personal issues of "country" relatives, hot combs, and free breakfast, there are universal themes, too, like bickering siblings, a critical grandparent, and a missing parents. Both the personal and the political stand tall in all three of Rita Williams-Garcia's books, giving writers and readers alike the vocabulary and the scope to enable them to look at their world against a push and pull of different background. This is an occasional series which proposes to study these elements in children and young adult fiction from a writer's perspective. "Does anyone know another word for the earth's constant spinning?" That was how I knew Sister Mukumbu was a real teacher, aside from her welcoming smile and her blackboard penmanship.She asked a teacher's type of question. The kind that says: Join in. When one of the kids called out "Revolving," Sister Mukumbu clapped her hands. Her bangles jingled. "Yes! All of your words are right, but 'revolving' is right on!" It's hard to think of politics, for some, in terms of children. It's harder for some with privilege to imagine the worlds of childhood as a microcosm of the larger world, but in many ways, it is. What kids hear at home plays out, full script, at times on the playground. The power dynamics, and the beliefs which parents might never have articulated are observed and displayed. The issues which with we grapple (or don't) at home are largely the issues which we explore or neglect in the public sphere. 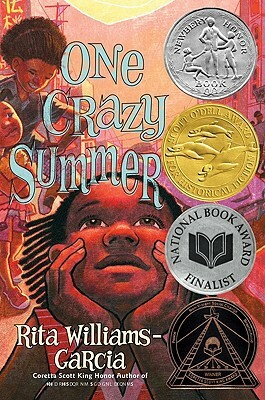 ONE CRAZY SUMMER introduces us to Delphine, Vonetta and Fern, and tells the story of the summer they spent in Oakland with their poet mother, who didn't want to be a parent, hadn't sent for them, and wasn't fussed about feeding them or keeping much track of them, really. Through trial and error - and a whole lot of bossiness on Delphine's part, the girls are herded through the summer, and develop the sprouts of a relationship with their mother. This book was praised for showing a particular facet of a lived experience of some black children in the sixties, contrasted against the swirling of political unrest, the Black Power movement, and the larger story of the Black Panthers of the 1960's. In this first of the trilogy, black families are revealed as both familiar and new, dimensional, and real, and the Panthers are seen less as solely paramilitary protestors, but as teachers and social workers, reminding some of a forgotten piece of their history. P.S. BE ELEVEN might have seemed, on the surface, less political. After the girls return home for the school year, they're immersed in the business of school, and home. Delphine faces major changes in her classroom, but learns the worth of a "Malcolm X Muslim" student in her classroom. The girls bear up under more of their endless grandmother's fussing, and must make peace with their father getting a girlfriend, and marrying her. Delphine's letters to her mother are filled, not with a little girl's thoughts, but with a growing young woman's questions. I love that her mother's constant refrain is Be Eleven. Be who you are, and where you are, right now. This is, of course, hard for an eleven-year-old to hear. A more personal political exploration came from Uncle Darnell's storyline. Uncle Darnell, who, since being back from Vietnam, was sleepy-eyed and always sniffling. Uncle Darnell, whose dimpled never showed anymore, and whose protective, uncle ways changed dramatically. Though my story was ten years after this one - the war lasted so long - I was Fern's age with a beloved uncle home from Vietnam, and I remember vast and bitter disappointments of broken promises and zoo trips that never happened. I suspect that children in this generation who are losing beloved family to alcohol and opiates and PTSD in this endless state of war that we're in, might weep in recognition. Though many people expect a second book in a trilogy to be a place-holder or filler, P.S. 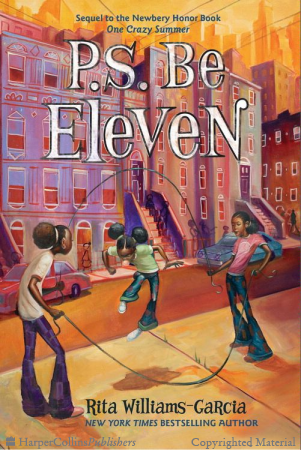 BE ELEVEN, with its secondary theme of enabling and independence, has a poignancy that once again brought the struggles of families of color - and really, families of any kind - who have stepmothers, on-again-off-again best friends, and the vicious claws of addiction dug into them into painful clarity. Turning eight hadn't grown Fern any taller. It had just made her mouthy. "Where's my watch?" she repeated. "Safe in my drawer, where you won't lose it." "Well, I want it," Fern said. "And you can't keep it from me. If you don't cough it up, I'll tell Mrs."
"I'll tell her, and she'll tell you --"
Then Vonetta, her ally, cleared her throat, fluttered her eyelashes, and finished ina voice as close to our stepmother's as she could mimic, "Delphine. Your sister is capable of wearing a watch." Capable was one of Mrs.'s words. She used it against me to make me stop helping my sisters. Vonetta is capable of doing her own hair Then Vonetta burned her ears with the hot comb, and who had to rub Vaseline on burned ears and finish pulling the hot comb through Vonetta's thick, thick head? Not Mrs.
As the little sisters grow up, they begin to slip from Delphine's grip. Naturally, Delphine has gotten tired of gripping them - she expressed this in ONE CRAZY SUMMER, when she doesn't break up a fight between her sisters, preferring instead to take the tongue-lashing when her mother has to leave the sanctuary of the kitchen to deal with it, but once you become accustomed to being the one in charge, that position of First has a little you-shaped divot. Now that her father has married Mrs., Delphine is being required to walk back the need to finish all the sentences, do for three little girls and learn to worry about just herself - otherwise she's finding herself cast in the role of the oppressor, trying to keep her sisters down, in Mrs.'s way of thinking. Since Big Ma has moved back to Alabama, and they're spending the summer with she, and Ma Charles and Ma Charles' sister across the creek, Delphine, Vonnetta, and Fern are also having to come to grips with Uncle Darnnell - and Delphine tries to force forgiveness from her sister. As the personal moves to the political, Delphine's eyes are opened to the difference between Oakland, Brooklyn, and small-town Alabama when the Sheriff is both a cousin and a white man, and when an emergency and a hospital stay brings up that "same old story" that both Papa and their cousin JimmyTrotter are familiar with - boundaries, walls, and obstacles put in the road these characters must walk. Racial prejudice, which itself accompanies each book, takes a new form as the girls learn versions of their family history, and how knots in the ties that bind them have also served as ropes keeping her great-grandmother and her sister apart. The history explored in this novel will likely encourage readers to dig into their own pasts for weird little quirks, big family secrets, and places where history intersected with lived experiences. Multiple layers of emotively personal and political history combine to braid together a narrative that is satisfyingly broad, yet very individually real. I cried tears of rage, grief, and laughter reading these books. Rita Williams-Garcia is a masterful storyteller. I received my copies of these book courtesy of the Benicia Public Library. You can find ONE CRAZY SUMMER, P.S. 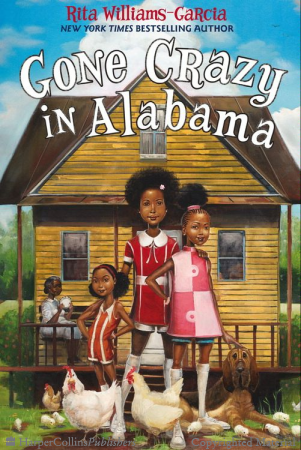 BE ELEVEN, and GONE CRAZY IN ALABAMA, by the inestimable Rita Williams-Garcia at an online e-tailer, or at a real life, independent bookstore near you!